I saw this yesterday as I walked in the afternoon. I didn’t have time to go for a walk, but as I drove down Roosevelt, the leaves were coming off the trees, and I had to grab my camera and get some shots of Autumn glory. 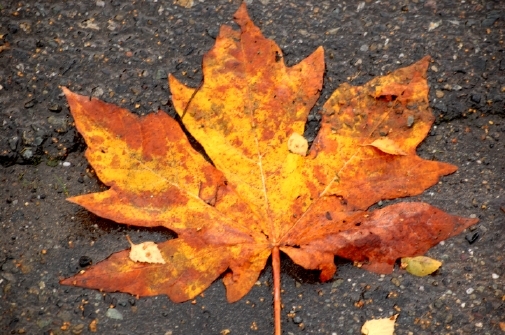 When I first came to Seattle in 1984, one of the things that grabbed me first was the Autumn maple leaf. Much to Anjie’s dismay (that’s an overstatement), I picked up about twenty of them and brought them home, dried them out, and kept them in a flat basket for a long time. They were just so magnificent, these stars that grew on fiery trees. We didn’t have such things in West Texas. I say “stars” because yesterday as I walked to Javasti’s in the early morning, the small leaves of red and yellow along the sidewalk made me think of stars and the night sky, and for a moment I imagined what it would be like to walk among the stars, like God. “The whole earth is full of his glory,” Isaiah heard the cherubim cry. Paul said that we are without excuse because the glory of the earth makes plain the presence, power, and love of God. The metaphor I often use when I talk to my classes about “glory” is that we walk in a world saturated with glory, almost as if the presence of God is the water we swim in, the air we breathe, the energy we rise into each morning. The physical life of the planet and its various creatures and races is astonishing in its “being-ness”, and the fact that not only is something here, but there’s beauty in it as well…well, it amazes me almost every day. Here’s the thing: since I’ve started watching more carefully, taking photographs like a madman for the past six months–call me crazy–I see better, discriminate between red and green with more clarity and ease (yes, that’s been a challenge in the past), and am just generally more in tune with my surroundings. There is beauty to be seen and had in the simple arrangement of chairs in preparation for a rehearsal, a conversation with a person unknown to me, the act of disciplines such as prayer and fasting, and even in the moment of pain and loss. It’s all grace, you know. I talked to someone I love very much yesterday of grace, amazing grace that freely sets us free. How strange that we can walk in it all our lives, and miss it completely. Thank you for this post. God has been gently reminding me lately of His presence and grace in the beauty all around me. I have found myself meditating for several days now on a quote from Michael Kimmelman’s book: THE ACCIDENTAL MASTERPIECE. I think grace, beauty, and God’s presence are the same way. They are out there, ready to be received if only we are prepared to recognize and receive them. 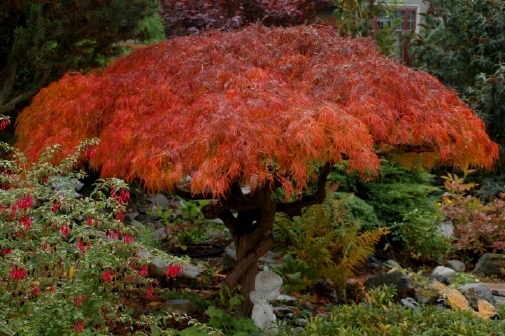 Jeff, I remember when I could look at a tree in a neighbor’s yard and realize for the first time that I did not have to own (or covet to own) that tree in order to accept its beauty as a gift from God because He gave me eyes to see it and He had opened my heart so I could look. A seed of faith had blossomed! Milt has sown good seed for many years. I believe God has chosen you to nurture and water that seed as God brings it to fruition. And the fruit will multiply!